The Remote Sensing Unit (RSU) at ROPME has been established in 1996 in accordance with the ROPME Council Decision taken during the Ninth Council of Ministers Meeting which held in Kuwait in the same year. 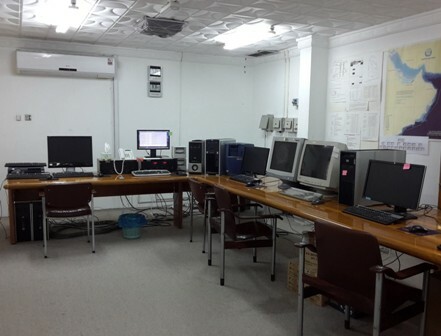 The Unit was especially established for the purpose of utilization of remote sensing data for near-real time marine environmental monitoring of coastal hazards and assessment of the state of the marine and coastal environments in the ROPME Sea Area. The main task of the RSU is, therefore, to process, analyze and archive received MODIS and other available satellite data for routine assessment of coastal water quality and early warning of the risks of harmful algal blooms (HABs), dust storms and oil spills in the ROPME Sea Area. Characterization and change detection of major sensitive marine habitats for better management of coastal natural resources and environments in the region. Documentation of the marine incidents and assessment of incurred damage to the marine environment in the ROPME Sea Area for environmental surveillance and accounting of the point source or parties responsible for pollution or damage. Training and capacity building of the interested researchers and specialists of the Member States on use of satellite imagery and its application in marine environmental monitoring. 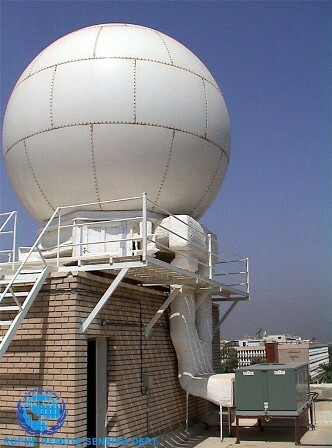 In order to be able to meet all of these tasks, a satellite ground receiving station was installed on the top of the ROPME Secretariat building in Al-Jabriya, Kuwait in early 2003 to be the first station of its kind in the region. This station currently receives and processes real-time data from NASA's Aqua and Terra MODIS sensor through direct broadcast using a 3-m X-Band reception antenna. The capability of the RSU at ROPME for near-real time marine environmental monitoring has been recently improved through installation of additional smaller yet reliable GEONETCast / EUMETCast station which receives lower resolution earth observation data from near-polar orbital satellite sensors such as MODIS, VIIRS, and Jason-3, as well as, meteorological satellites such as MetOp-B, Meteosat and NOAA. The main monitoring instrument for real-time ocean and coastal monitoring in ROPME is the MODIS Direct Broadcast receiving system. This system is being operated by the RSU and currently receives and acquires real-time data from NASA's Aqua and Terra MODIS sensor, which then are processed to standard ocean products (sea surface temperature, chlorophyll concentration, backscatter and absorption) for routine marine environmental monitoring and distribution. 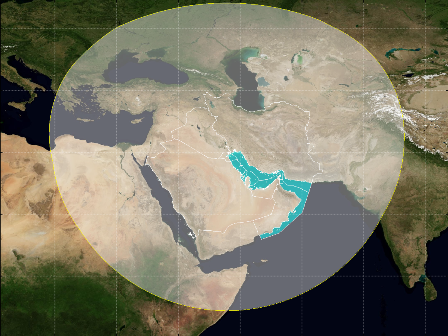 The coverage area and footprint of the ROPME-MODIS ground station is about 25 million sq. km (within a radius of up to 2800 km). Antenna system (Outdoor equipment) – X-band (8-2.5 GHz) auto-tracking 3m parabolic dish antenna, rotator, controller, RF components, GPS antenna, X-band feed, LNA and down converter; all housed in a protective 5m x 5.5 m weatherproof radome. Control Unit (Indoor equipment) – modular receiver rack, demodulator, UPS, ingest and data capture PC and processing and visualization PC. Control Unit of MODIS ground receiving station at ROPME Secretariat. GEONETCast / EUMETCast reception system is a multi-service data dissemination system based on standard Digital Video Broadcast (DVB) technology. A single GEONETCast reception station can receive any combination of the provided services. It uses commercial telecommunication geostationary satellites to multi-cast of space-based & in-situ environmental data in near-real-time. This data is distributed from a regional provider (EUMETSAT, NOAA, CMA) to users in Europe, Africa and worldwide. EUMETCast is the EUMETSAT (European) contribution to the global GEONETCast network with coverage over Europe, Africa, west Asia and the Americas. 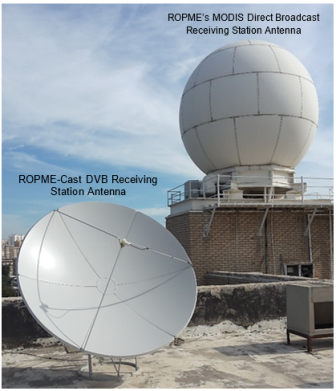 Having considered this advantage, a new EUMETCast Ground Station was installed in the ROPME Secretariat in December 2015. It is specially installed to support the MODIS Direct Broadcast Station and securing supply of regional marine environmental data. This station receives data, among others, from MODIS & VIIRS Ocean Color products, sea surface temperature; Meteosat & GEOS image data; EUMETSAT meteorological products; CMA FY2C products. 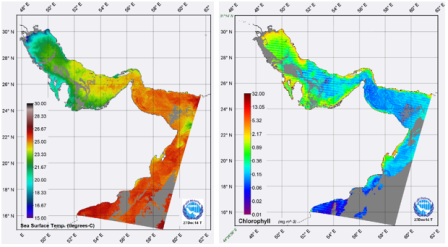 Satellite-derived parameters that are routinely monitored and assessed on daily bases by the RSU include sea surface temperature, surface chlorophyll concentration, and diffuse attenuation coefficient. True and false color images showing clouds and dust coverage and other major features at 250 m to 500 m spatial resolution are also produced throughout processing of received MODIS data. This data is validated from time to time through the help of the national focal points through in-situ measurements or sometime though field check using available remote sensing instruments like hand held spectrometer. Most of these data products are delivered in hdf format but they can also be supplied in GeoTIFF or other standard formats for assimilation by GIS systems. In addition to archiving the near real time data received from MODIS, the RSU also holds an extensive archive of satellite data from other sensors e.g. AVHRR, Landsat, Radarsat and Aster. data acquired on 27 Dec. 2014. Satellite data received and processed by the RSU is essential for real time monitoring of coastal hazards and unusual marine phenomena / incidents in the ROPME Sea Area. This data is routinely used in number of applications such as assessment status of coastal water quality and risk of oil spills, measuring ocean surface temperature for detection of upwelling areas and other dynamic features, early warning of risks of cyclones, dust storms and other hazards and monitoring ocean colour for detection of the harmful algal blooms and sediment plumes. Products of this data are therefore essential and very critical for providing a regional and local environmental management information to concerned authorities and national focal points to enable them for taking a sound decision-making in critical applications, e.g. monitoring of oil spills, harmful algal blooms, dust storms, cyclones, etc. In addition to data processing and analysis of received satellite data, ROPME through its RSU and Integrated Information System (RIIS) also plays an important role as service provider to the Member States and end users in the region by dissemination and distribution of the data products that are related to the state of the marine environment and other marine environmental issues in the region. The RSU is also concerned with development of methodology and integrated tools for monitoring and assessment of marine and coastal environments by satellite remote sensing. In this context, the RSU welcome proposals from interested organizations and partners to jointly develop applications of remote sensing data. ROPME through its RSU also organizes remote sensing training courses to young marine researchers and specialists who are involving in satellite-based environmental monitoring or/ and coastal zone management. This training aims to improve scientific and technical skills in the field of satellite image processing and application of remote sensing data on the ROPE Sea Area e.g. in assessment state of the marine environment, mapping of coastal habitats, trajectory of oil spills and dust storms, etc.